Discussion in 'Operating Systems' started by Extraordinary, Mar 21, 2017. Every time I get a notification about there is update and i click on it and it show nothing, it usual on the day CU is released, and winshowhide app, has that cu that was just released in the hidden few days later i get notification again and it listed in WU window. Ok, I don't use wushowhide so not sure. Cause I got notification about KB4023057 again wanting to be installed today. I am not sure, but IMO they keep using that number for compatibility updates for newest build, so if you are on newest that will stop AFAIK. Isn't that the update that installs this piece of microsoft turd? "UpdateOrchestrator" of something along those lines, it bypasses Windows Update and forces 10 to upgrade to a new build regardless of the new build being compatible or not.... it basically shoves it down your pc's throat and says ENJOY. I am on 1703 and got a handfull of those updates, it never forced a update. I have it set to like 250 day delay. 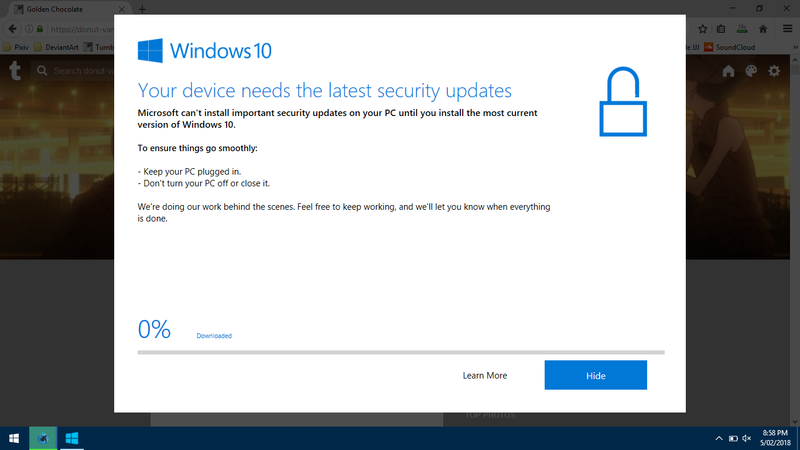 I do let it do security updates, basically waiting to see how Spring CU performs from others. 1)OS Remediation System Service :A lightweight service for understanding and remediating OS update issues. Well, that makes sense now.